For this week's Tuesday View, I decided to photograph the border at an entirely different time of day . 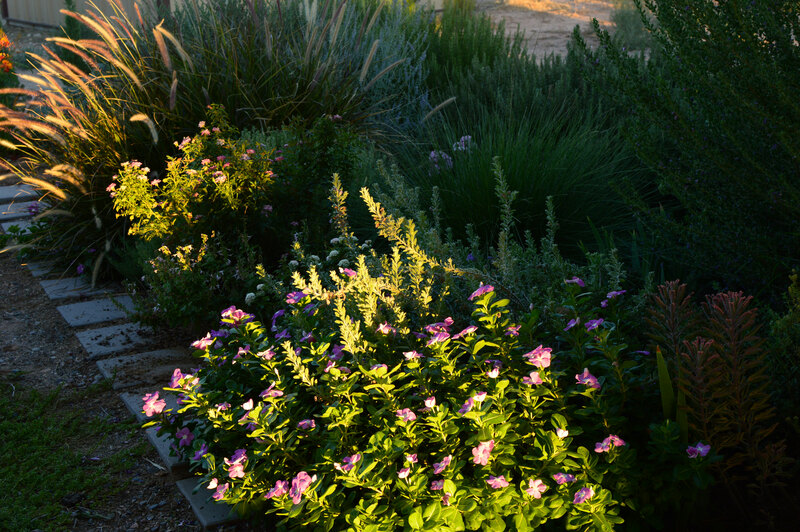 These pictures were taken in the evening, when the western light was already low enough to shoot along the length of the patio and illuminate the top end of the border. 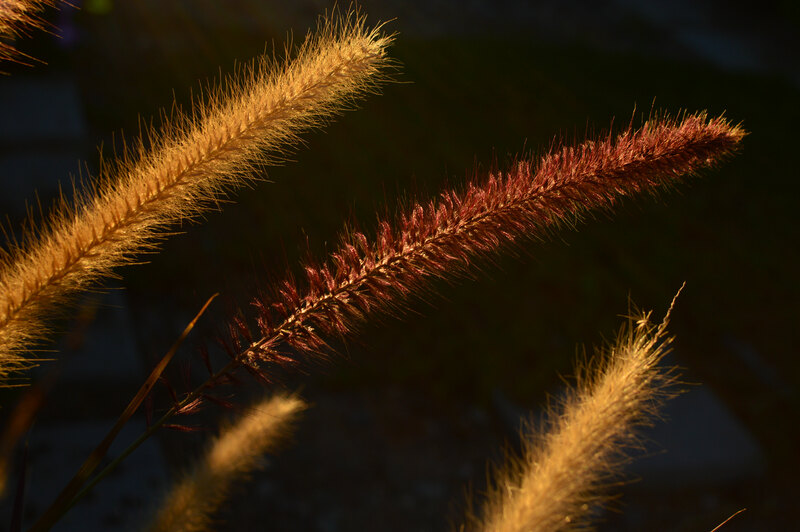 This meant some wonderful backlighting for Pennisetum setaceum rubrum. It is opening plenty of new wine-red flowers right now, while the old fade to a soft straw color. The biggest event in the border this past week was the sudden burst of bloom from Leucophyllum frutescens, generally out of sight at the top right corner of the usual view. 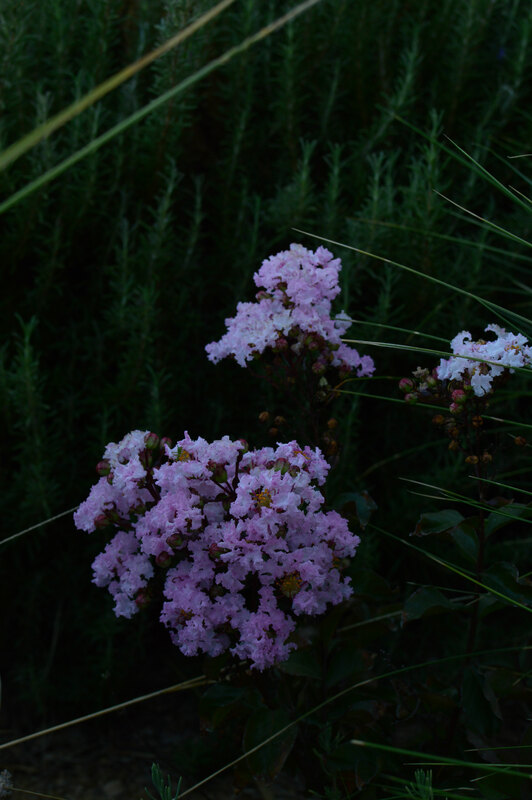 The blooms drop almost as quickly as they come on, so there is little left now but a scattering of spent flowers. Elsewhere, Lagerstroemia "Rhapsody in Pink" is blooming quite well, considering it is still a small plant. It has grown very slowly - I'm not sure why; and this summer started out badly for it. It seems to be making up for lost time so far as flowering is concerned. The leaves of Muhlenbergia capillaris "Regal Mist" are stretching out in its direction. Once the Crape Myrtle is tall enough, the grass will form an elegant mound at its feet, coming into bloom shortly after the Lagerstroemia stops. But for now they do compete for space a little bit! Thank you to Cathy for hosting the Tuesday View at Words and Herbs! A perfect way to show off the Pennisetum! 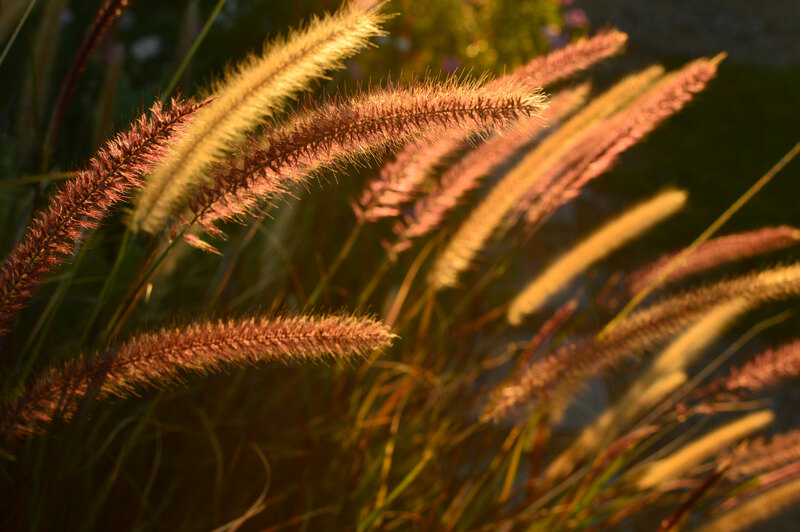 The Pennisetum is simply gorgeous in the evening light! Light can play such a big role in gardens! Great choice of time of day! The warm light is wonderful, especially for the grass heads. Many thanks, Annette! That photo session was a good reminder to me to keep shooting at different times of day, especially now as the light is changing so quickly with the season. I'm so glad to hear you have planted Leucophyllum; I hope it will settle in and grow well for you! :) I think some of these plants have the potential to grow in a much wider climate range, and so I am glad that people are giving them a try in various locales. We gardeners may be opportunists, but so are many of our plants! ;-) Wishing you a wonderful day! Thanks so much, Kris! I haven't noticed it like this before, but the sunlight is shifting south and hitting the garden at different angles now. Thank you so much, Cathy :) This is another plus for grasses, I think - the way they display the light! Thanks very much, Hollis :) I'd not noticed the sunlight striking the Pennisetum like this before, but then I realized that the season really is changing and the sunlight falls through the patio at different angles now. It's still very much summer here (I believe we hit 107 today), but I can feel the shift quite strongly this year. 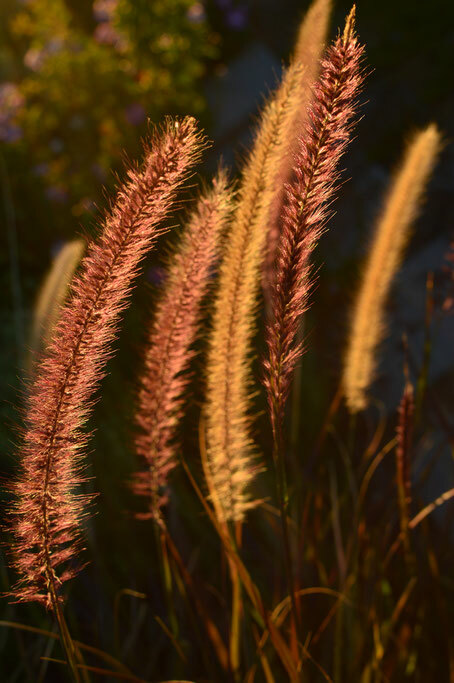 The Pennisetum is beautiful in the evening light. Amy, The border looks beautiful! 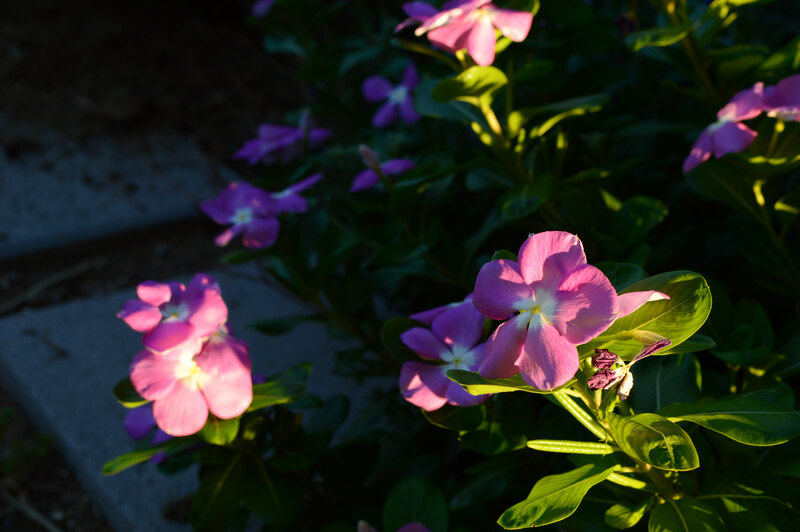 the Catharanthus is a splendid plant mine always prefered shaded areas. 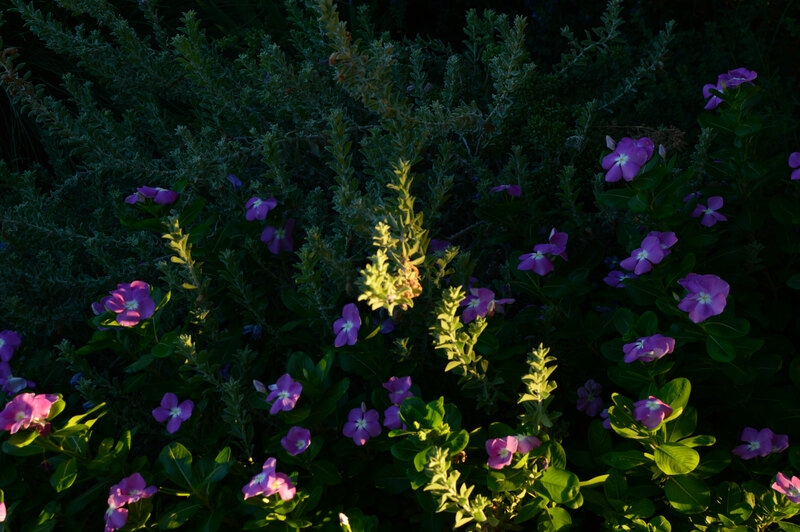 The pictures of your oasis of lushness in the desert is always a treat! have a great week!